During the Sixties, America and the USSR competed for supremacy of the solar system. But history has overlooked a third space race contestant - a group of seven students at a university in Lebanon. A few years before they became the first Arabs to send a rocket into space, the members of the Haigazian College science club, in Beirut, encountered a problem. They had the materials to build a craft - some of which they'd bought with their own pocket money - but they still hadn't produced a propellant. The first suggestion had been gunpowder but experiments on a couple of 12in-long cardboard rockets had resulted in explosions rather than the perfect chemical reaction required to send a vessel several miles into the sky. Then, after more lab work and guidance from their teacher, a brilliant young maths and physics lecturer called Manoug Manougian, they'd decided the solution was a mixture of zinc and sulphur. But they'd still not worked out the correct proportions. The chemicals would burn, but they needed to find a combination that would give the rocket enough thrust. Manougian was also aware they couldn't possibly test it in their physics lab. They'd require space; somewhere away from people. The family of one of the students owned a farm in the mountains, and over the course of several weekends, Manougian and his team went up there to experiment. Finally, they came up with something that would generate enough energy to make their 2ft-tall rocket move. That first craft, called HCRS (for Haigazian College Rocket Society) and launched from the back of a rod stuck in the ground, climbed to 1,200 metres. "We have something," Manougian thought. It was 1961 and the Soviet Union and the United States were four years into a dramatic space race which had begun with the former's launch of the Sputnik satellite in 1957. But while millions of words have been written about the two superpowers' attempts to gain supremacy of the solar system, precious little has been said about a third, highly unlikely, competitor. Between 1961 and 1966, Manougian and his group of seven undergraduates ended up building 12 solid-fuel rockets - one of them so powerful it reached the thermosphere, now home to the International Space Station, and became national heroes in Lebanon. Now, thanks to a new documentary, their extraordinary achievements - instigated by Manougian as an interesting way to teach his students basic principles of physics and maths - are finally being recognised by the rest of the world. The film, The Lebanese Rocket Society, is also a poignant reminder of what could have been in a country that has been ravaged by war in the intervening years. "We wanted to make a film about dreamers," says the Lebanese co-director Joana Hadjithomas. "We needed to understand what kind of dreams people have had for our region." Manougian has lived and worked in the US for a long time now - currently as a mathematics professor at the University of South Florida. Armenian by blood, he was born in the Old City of Jerusalem in 1935, but 10 years later his parents relocated to Jericho in the West Bank to escape the conflict between Jews and Palestinians. It was around this time that he read Jules Verne's novel From the Earth to the Moon, a gift from his uncle which he refers to as "the genesis of my fascination with science, rockets and space exploration". As a child with little else to do, Manougian would climb to the top of Mount Quarantania - said to be the Biblical "Mount of Temptation" - and look out over the vastness of the land around him and upwards to the stars wondering why he couldn't fly to the moon. "The idea was fascinating," he says. "And I realised there shouldn't be any boundary as to where we could go in the universe." After graduating from St George's School, Jerusalem, he deferred a scholarship to study at the University of Texas at Austin in order to help prepare other St George's students for their exams in maths, physics and chemistry. His future wife, Josette Masson, was one of those students, and in 1956 the pair finally headed to the US - Masson to Ohio for work, and Manougian to Texas to further his studies. In 1959, Manougian visited Masson in Cleveland, spending the summer working in the city's steel mills. After a strike closed the mill, his boss told him to keep busy and Manougian took the opportunity to design and build his first single-stage rocket. With no way of accessing propellent, he knew he'd have to wait until he got back to Lebanon to launch it. The following year, in Jerusalem, Manougian and Masson married and that autumn he joined the faculty of Haigazian College in Beirut. Many of his students were the children of survivors of the 1915 Armenian genocide, whose parents had moved to Lebanon to escape the atrocities. The American University of Beirut was the country's leading educational institution at the time but even it wasn't known for science and technology. "During the Sixties there was calm, politically, and Lebanon was happy producing businesspeople and doctors from the university's medical school, but in terms of science not much was happening," says Manougian. "There were few research projects." After the success of the first HCRS rocket in April 1961, Manougian and his team altered the position of the fins and re-constructed the nose cone of the rocket to give it better thrust. Again, they went up to the top of the mountain. "Across from us was a valley; no villages, no houses," Manougian recalls, "so I figured it was safe to launch in that direction. My entire concern was getting this thing off the ground." This time, though, instead of going where he had anticipated, the rocket zoomed off behind the assembled dignitaries and students. "The entire student body, the president [of Haigazian College] and everyone else just stood there looking from the top of the mountain to see where it was going to land," Manougian says. "It was made of metal and I was so worried it could hurt somebody. Then I noticed this crowd coming out of a Greek Orthodox church, and suddenly part of the rocket stuck in one of the rocks in front of the building." Luckily nobody was injured. But after that, Manougian received a message from someone in the Lebanese government saying that future rockets could only be launched from specially designated launch pads. He was offered the use of Mount Sannine, an 8,500ft summit in the Mount Lebanon range used by the country's military. "They even offered to send a jeep to carry our equipment," Manougian says. With the loan of a mountain, his next challenge was to launch a multi-stage rocket that would separate in flight and travel a lot further - up to 10 miles. Budget was an issue from the beginning: where Nasa would spend $23 billion on its manned space programmes in the Sixties, and the Soviet Union between $5 and $10 billion, for the six years of its existence, the Haigazian College Rocket Society project cost around $300,000, Manougian estimates. Nasa, of course, was attempting to land a man on the moon, not merely to send a rocket on a suborbital flight, but nevertheless, in contrast with the space agency's 400,000 employees, Manougian had seven students who hadn't yet graduated, at a tiny university in a country with a population of barely two million. Manougian spent part of his own salary on rocket parts; he pulled a favour from a fellow Armenian living in Beirut who provided the metal tubes needed to manufacture the rocket's shell and he also welded them for free. "[The Armenian community] became so excited that here was an Armenian guy and an Armenian college doing something that nobody else in the Middle East was doing," he says. He was also offered the expertise of Lebanese Army captain Joseph Wehbe, whose speciality was ballistics. Perhaps naively, Manougian says his excitement seemed to circumvent any doubts he may have had that the army was using his society's intrepid technological adventures for its own ends. The challenge for Manougian was to devise a solution so that all the propellent in the first stage was exhausted before the second stage ignited and separated. "I remember waking up in the middle of the night," Manougian says. "Josette asked what the hell was going on and I said I've figured it out: I needed to place a battery in between the two rockets. And as long as the first stage is not generating any acceleration - because it's run out of propellent - it will slow down for a fraction of a second, forcing the second stage to ignite. It was so simple." The difference between a single-stage rocket and a two-stage rocket was vast. As Manougian puts it: it went from "kids doing these interesting things to a viable rocket which wasn't a toy." Suddenly, the society's work was not just some university sideline but a project of national import and, in August 1961, Manougian and his students were invited to meet the then-president of Lebanon, Fouad Chehab. "He said he was very proud that such scientific experiments were being done in his country - and he ended up saying he was going to support us financially." Manougian says he was nervous that the financial aid being discussed could end up coming from the Lebanese military and he was relieved to find it was to come from the Ministry of Education instead - to the tune of 100,000 Lebanese pounds (about £12,500). The weather was beautiful the morning Manougian stood staring at his three-metre rocket, named Cedar 2, sitting on the launcher on the top of Mount Sannine, surrounded by colleagues, students, representatives of the Lebanese government and military, and the country's media. Even though the society's single-stage rockets had been a success, he wasn't sure if this latest one would just explode on the launcher. His heart was beating fast as he watched the device shoot upwards. "It was a perfect launch," he says, "and as the two stages separated the students screamed. I screamed: ‘It worked.'" 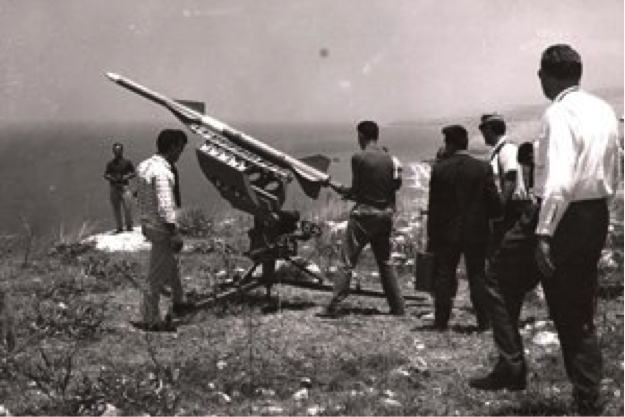 With the name of the club now changed to the Lebanese Rocket Society, Manougian and his team were given an abandoned army artillery range at Dbayeh on the outskirts of Beirut, overlooking the Mediterranean. Manougian was interviewed on radio and television and their antics garnered front-page headlines. One article said the two-stage Cedar launched its four-minute flight on a 68-mile trajectory before splashing down in the Mediterranean. "With the setting sun glistening on its red-coloured sides... the 350kg rocket climbed slowly from the launch pad into the southwestern sky - leaving a vapour trail across the Bay of Beirut." Inspired by news that the Soviet Union had sent the first human, Yuri Gagarin, into space, Manougian considered sending a mouse up in one of his Cedars. "We even named him Mickey," he says. "Then I asked Josette to prepare a parachute so that we may bring the nose cone and Mickey safely back to Earth. But being an animal lover, Josette used all her persuasive talents to stop us from launching him." Mickey, Manougian says, remained safe in the Lebanese Rocket Society lab. "And it was a good thing I listened to her," he says, "because the parachute didn't deploy." By now the team had begun designing its first three-stage rocket, capable of reaching the thermosphere, which begins at around 50 miles above the Earth's surface. Cedar 3 was launched in November 1962 to mark Lebanese Independence Day. The following year postage stamps were issued to mark the launch of Cedar 4, something Manougian describes as "perhaps the most telling of expressions of pride in the project". In early 1964, while Manougian was on a sabbatical from Haigazian, studying for a Master's degree in Texas, one of his students experimented with some dangerous chemicals which exploded and set fire to the physics lab. The student lost an eye, received third-degree burns and permanent damage to one of his arms. On returning to Beirut, Manougian was devastated and considered ending the project. Instead, he moved the entire operation to the army workshop for safety. Manougian says that during the years that the rocket society was active, a sign on his office wall read: "Chemicals may be used to poison people, or they may be used to cure the sick; atomic power may be used to annihilate nations, or it may be used to generate electricity; rockets may be used to cause death and destruction, or they may be used to explore the universe". That said, for the last couple of years he had noticed that his work was being closely monitored by "people from the Soviet Union, the CIA and Mossad. "They called themselves cultural attaches," he says. "I met with the head of the CIA several times and made it clear to him what I was doing so he understood there was no military operation going on. He'd ask me questions about the propellent." Manougian says his work was an open book. "There were no secrets and I was eager to demonstrate the peaceful and scientific nature in the uses of rocketry." One time he deliberately placed a paperweight on top of some papers on his desk and when he returned they had been messed up. "Next time I left a note on my desk in large letters saying my filing cabinet was open and my papers were available to look at, but please do not mess up my desk." Years later, he says Wehbe confessed that the Lebanese military was never interested in seeing fireworks. "He was very frank," Manougian says. "He said their interest was to see whether they could convert it into something the military could use and he apologised for not telling me that when we were working together. "From 1964 until 1966 we were launching fairly sophisticated rockets - far superior to the ones Hizbollah uses now. What they use are so primitive. They have no directional capability. And ours reached further than theirs can." After Manougian returned to Texas the country's interest in rockets continued and in 1967 Lebanon launched Cedar 10. But, in the wake of the Six Day War, the West was no longer prepared to tolerate such a programme and the government was told to halt all rocket activities. Hadjithomas and fellow Lebanese film-maker Khalil Joreige stumbled upon Manougian's story in 2000. "Today, we're much more aware of what can happen militarily," Hadjithomas tells me from her home in Paris. "But in the Sixties, Manoug and his students couldn't see that, little by little, the army was taking advantage. When we were making the film we had a lot of discussions about that. He was really upset by it. It was a betrayal in a way." Hadjithomas and Joreige also discovered that, although the rocket society's achievements were huge, very few people they spoke to who had lived through the period remembered the Cedar rockets at all. "So the film became our journey to discover why nobody remembered it," Hadjithomas says. The film-makers found that even the memories of the generation old enough to recall the rockets taking off from those mountains on the outskirts of Beirut had become clouded by decades of conflict. At the end of the film, we see Hadjithomas and Joreige themselves spearheading an effort to have a life-size replica of the Cedar 4 rocket mounted on a plinth and placed in the grounds of Haigazian College (now Haigazian University) - a lasting monument to Manougian and the extraordinary club he founded. "We wanted to continue the gesture of the dreamers," Joreige says. "To give physicality to this memory; and to say that we are able to continue dreaming today."